We’d love your help. 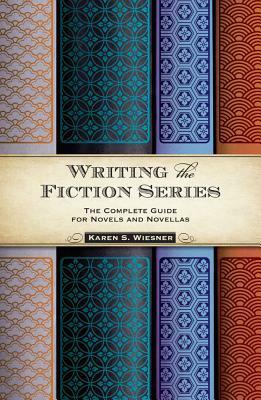 Let us know what’s wrong with this preview of Writing the Fiction Series by Karen S. Wiesner. The definitive guide to crafting a series! From the Hunger Games Trilogy to the Jack Reacher Series, from Harry Potter to Harry Dresden, there's no denying that writers--and readers--have caught series fever. But if you're contemplating writing a series, there are plenty of considerations you'll need to make first. Writing the Fiction Series is the complete guide to ensurin The definitive guide to crafting a series! From the Hunger Games Trilogy to the Jack Reacher Series, from Harry Potter to Harry Dresden, there's no denying that writers--and readers--have caught series fever. But if you're contemplating writing a series, there are plenty of considerations you'll need to make first. Writing the Fiction Series is the complete guide to ensuring your series stays hot after the first, fourth, or even fifteenth book. •	Write a series that captures the hearts of readers and stands out in a sea of competition. •	Find the focus of your series, develop your idea, and plan ahead. •	Hone in on the two most important aspects of series writing: characters and consistency. •	Utilize a variety of series organization techniques, complete with downloadable worksheets and checklists. •	Market your series effectively and increase your sales. With insights from nearly 100 series authors and publishers, as well as Grow Your Series Muscles" exercises, Writing the Fiction Series is the only book you'll need to write a series that sizzles. To ask other readers questions about Writing the Fiction Series, please sign up. 1.5 stars, because I did not enjoy this read at all and got *very* little out of it, but I believe others can get more than I did. "Writing the Fiction Series" is (unintentionally, I believe) heavily weighted toward commercial romance series. Wiesner thoroughly discusses combining genres--for example, fantasy with humor, romance with suspense, historical fiction with time travel or other sci-fi aspects, etc.--but the vast majority of her advice would not necessarily hold in, say, the SF/F/Horror 1.5 stars, because I did not enjoy this read at all and got *very* little out of it, but I believe others can get more than I did. The book is overloaded with anecdotes, both from Wiesner and others that she interviewed in the process of writing it. Anecdotes are all well and good to support a stance or idea, but there were zero statistics included. Everything was viewed toward Wiesner's lens of "this is what I've heard or read online," which grew into a major trust issue before I had even gotten halfway through the book. It's not that there is no merit to the advice provided within "Writing the Fiction Series," but that it hugely overgeneralizes over and over again. After tripping over a silent, "but that's not true for SF/F/H" for the sixth time, everything I read became suspect. Finally, in an attempt to illustrate both sides to each argument (for example, how close together series installments should be released, or whether a book or series should be left open-ended), Wiesner succeeds only in waffling between the stances that she prevents. The books suffers from an overabundance of "on the other hand"s and "of course, so-and-so does it differently." Not only does this book fill in a long overdue gap in craft skills for novel writers, but it also delivers. Although I knew a preview copy was enroute, I couldn’t wait so purchased the kindle copy to get started. And I stayed up very late my first night reading. This does not happen very often with craft books. In fact only a few of the writing books I read make it to my column. Wiesner is also the author of First Draft in 30 Days, and From First Draft to Finished Novel. One ongoing feature of her books is her inclusion of practical, accessible worksheets and graphs. Organizing one novel can be daunting at times let alone a series. Wiesner skillfully blends the organizational skills together into comprehensive sanity. Although, here I do need to note that the sketches and outlines didn’t always show up well on the e-book version. The print copy is much better at the design layout for easier reading. And that is the key behind this book: writing a quality series. Wiesner details the definitions, catalyst, styles, focus, organization, and marketing required for any series by showing explicit examples, case studies and stumbling blocks. She thoroughly examines and warns about the importance of characters and consistency when writing across extended novels. On the surface this might seem to be common sense, but in reality it is a danger that can sink your series, and/or lose future readers. Writing the Fiction Series warns you of the potential landmines and shows you navigable routes to write a sustainable high-concept fiction series and enjoy the process. Advice that is long overdue. Advice that is fun to implement. The title, "Writing a Fiction Series," speaks for itself. Karen Wiesner has produced a tremendous manual on how to achieve the fiction series you are longing to write. It doesn't matter if the series is short or long, Wiesner provides the nuts-and-bolts of all things writing over an extended number of volumes. All the basic concepts are covered from vocabulary to plot development. There are a number of terms you may be unaware of while developing your series; this book will provide the terminolo The title, "Writing a Fiction Series," speaks for itself. Karen Wiesner has produced a tremendous manual on how to achieve the fiction series you are longing to write. It doesn't matter if the series is short or long, Wiesner provides the nuts-and-bolts of all things writing over an extended number of volumes. All the basic concepts are covered from vocabulary to plot development. There are a number of terms you may be unaware of while developing your series; this book will provide the terminology you need to communicate to others in the writing and publishing industry what are want to get across to readers. She discusses the micro- and macro-levels of your series are laid out, explained, discussed, and shown how to develop. And the best part of the book is the massive amount of illustrations. A good third of the book's length, practically, is filled with examples from a slew of series in a variety of genres. If you require illustrations aside from the abstract discussion, this book has plenty of them to get the points across. I should say, while this book is geared toward fictional series, the same concepts and technique readily apply to the non-fiction series as well. Of course, there are other things to deal with in a non-fiction series that you might not have to confront in a fictional series--such as research, bibliography, and notes--but the premises of Wiesner's fictional series explanations can still apply. I would highly recommend this book for the aspiring or established reader who is looking to further their writing skills through the development of a series. Wiesner show how fun the process can be while covering all the bases. If you're considering writing a series, this is where you must start. Included are lots of extras that you will go to again and again to keep things straight. It doesn't just contain advice on writing the series but additional how to sell it to a publisher and/or market your series. I've been searching high and low for a book on this topic. This was fabulous and so helpful. Highly recommend it. With a different, more honest title, this book would get a four stars from me. But who ever chose the title was trying to draw in a larger audience than the book actually stands to serve. More properly, this book should be labeled "Writing the Romance Fiction Series". Karen S. Wiesner writes commercial romance, mostly, though looking at Amazon, she seems to have taken a turn to writing book on writing for the last few years. I would certainly be concerned if anyone tried to copy her book cover s With a different, more honest title, this book would get a four stars from me. But who ever chose the title was trying to draw in a larger audience than the book actually stands to serve. More properly, this book should be labeled "Writing the Romance Fiction Series". Karen S. Wiesner writes commercial romance, mostly, though looking at Amazon, she seems to have taken a turn to writing book on writing for the last few years. I would certainly be concerned if anyone tried to copy her book cover styles. She holds them up near the end of the book as examples of branding, and while they may have served her fine in the earlier 2000's, they do not scream quality covers in today's market (2019). She does, however, make an excellent point about series logos, which I do recommend. The rest of the book is half quotes from authors she interviewed, or quotes from readers she found on message boards by readers, and half recommendations on series writing (once she's done defining what styles of series exist.) I found the first fifty pages the most useful in general. After that, I found the material very focused on romance and not so useful for my genres. The last hundred plus pages are appendixes and charts and worksheets. I picked this book to find out how author's create arcs and characters for a series. However, this book leans a little too much into cozy mysteries and romance series for me and I found much of the information about series not very useful. Here is an example: "The word series has many connotations in fiction writing, but in the most basic sense, an ongoing book series is any continuing or interconnected set of stories." Okay, I already knew that. It seems obvious. The author goes on to elaborate I picked this book to find out how author's create arcs and characters for a series. However, this book leans a little too much into cozy mysteries and romance series for me and I found much of the information about series not very useful. Here is an example: "The word series has many connotations in fiction writing, but in the most basic sense, an ongoing book series is any continuing or interconnected set of stories." Okay, I already knew that. It seems obvious. The author goes on to elaborate on what ties series together. I had no problem with that, but in her examples she should have included a Lee Child, a James Patterson or even Robert Ludlum. Lee Child purposly doesn't describe Jack Reacher in detail. Is it important to leave things to the reader's imagination or describe in detail like Sue Grafton or let them identify with the hero like Lee Child? Do most authors stumble into a series or purpously write one? For example, Jack Reacher is a loner, like the Lone Ranger, Reacher goes on his way stumbling across crime and helping people. Overall Writing the Fiction series was an okay book but it was no page turner. And if you're reading more books like this instead of writing, put it down and get going with your own story. If you want to know how to plan and write a fiction series in any genre, check this book out. When it comes to providing examples, Wiesner does toot her own horn but also provides other authors' examples which balances out the experiences. It's not a fast read by any means, especially if you plan to use the appendixes to try out some of her suggestions on your own writing. One of the few books where I read and realized that I needed for my own collection. I think this is a good start but I’m going to be honest - I’m disappointed. I didn’t learn much from this book about series at all. As a writer, I want to learn how to juggle multiple characters and plot arcs through a story and a series but there was no touch on that. It was more like here’s what a series need (lots of definitions and interviews) but no actual HOW to go about doing them. So so many helpful things in this book. I've been working on a series for 7 years, changing it constantly because I didn't know where it was going or how I wanted it to end. Karen Wiesner is amazing and knows her stuff. Excellent book on writing a series. A must for authors who want to write a fiction series. I actually skimmed most of this because it was all stuff I already knew. Good for beginners, I guess, and there were some good tidbits I got out of it, but mostly, it was so verbose that I just wanted to be done reading it. It took a long time to read this, but I do believe it made some good material for any newcomers in the world of writing fiction. A lot of people don’t realize how much work actually goes into writing a novel now a days, at least, if it’s going to a well written one. The book was a way to realize what exactly needed to be done in order to really get started; I especially liked the way it differentiated between story arc and the series arc; I’m currently in the process of working on a series, and It took a long time to read this, but I do believe it made some good material for any newcomers in the world of writing fiction. A lot of people don’t realize how much work actually goes into writing a novel now a days, at least, if it’s going to a well written one. The book was a way to realize what exactly needed to be done in order to really get started; I especially liked the way it differentiated between story arc and the series arc; I’m currently in the process of working on a series, and that information feels very useful. Also, total side note, the book also references Harry Potter a lot for the process in relation to what the chapter is about, and since I love HP, that was also a plus, and it helped make some stuff make more sense actually. I also liked how the author interviewed so many different authors on their process and what they did for their books/series and it’s relieving, but also nerve racking how they can be so different. It makes it harder to decide what’s going to work for you personally, but still a good starting point. The only thing I really questioned was in the post writing section was when you decide to space out your books if you’re writing a series. They said you should do two or three a year because readers will be impatient and lose interest. On the reader side, yes I agree I’d be impatient waiting for one book a year (and I have for some books, sometimes 1 year+) but if I’m a fan, I’d still be loyal and wait, at least if the series seemed interesting enough to continue with. Looking into the author, I see she writes a lot of the harlequin romance series or books in that kind of work, so maybe the waiting period expectation is different since those aren’t as thick of reads? Maybe, I’m not sure, but it’s a guess. I did not care for this at all. I'd just read a really excellent "how to for writers" book, so it's difficult to judge this one in a vacuum. But this one... I was prejudiced against it by the lackluster introduction. No, chapter two does not "hone in" on anything. Maybe that was a typo that eluded all rounds of proofing, but it made me mistrust this writer. The intro also explained that chapter three delves into [X] topic, chapter four lays out, ch. five lays out, ch. six delves... really? There I did not care for this at all. I'd just read a really excellent "how to for writers" book, so it's difficult to judge this one in a vacuum. But this one... I was prejudiced against it by the lackluster introduction. No, chapter two does not "hone in" on anything. Maybe that was a typo that eluded all rounds of proofing, but it made me mistrust this writer. The intro also explained that chapter three delves into [X] topic, chapter four lays out, ch. five lays out, ch. six delves... really? There are no other verbs for exploring, explaining, depicting, describing, investigating, relating, probing, analyzing? This book was very helpful in changing the way I think about planning a series; it's exactly the resource I needed for looking at the big picture beyond the individual novel. In particular, the appendices with worksheets and examples were very useful, and I will continue to use them as resources in the future. Wiesner clearly comes from a viewpoint of experience, having written many series. This is good, because I can accept her authority on the subject. Although her ability to give first-hand e This book was very helpful in changing the way I think about planning a series; it's exactly the resource I needed for looking at the big picture beyond the individual novel. In particular, the appendices with worksheets and examples were very useful, and I will continue to use them as resources in the future. This book had some very useful information. However, between her extreme enthusiasm for Harry Potter and her tendency to beat a point into the ground, I was more than happy to be finished with it. Also, don't let the thickness fool you. Over half of the book are series spliced down into examples. This book had a lot of good information. It's written for traditionally published authors but as an indie author I was still able to take a lot away from it and learn the tips and tricks of writing a successful series. Excellent resource if you're going to be writing any kind of fictional series. The worksheets at the back will really help you get your series organized and keep track of all your different character arcs, etc. This book is intended as a resource for authors developing a series. Although much of it maybe common sense and overloaded with examples, an author could use this as a checklist for series development. It also includes worksheets that an author could tweak for his or her own style. There were some good pearls in here. But the author wastes a lot of time on examples. If I didnt understand the concept to begin with five examples prob wont help much. Maybe try just one.